Cartoonist I do the Tomversation comic panel. I also do the Tomversation blog about arts, culture, history. We have an eclectic mix of items on our site. I‘ve been experimenting with Etsy sales. I’ve added items from our main printing and promotional business to raise awareness as well as to make sales, but I’ve also placed items on the site that can be purchased as a single item – t shirts, coffee mugs, shower curtains and such. And in a short time, I learned these 10 ways to increase Etsy sales. Fill in the whole headline and don’t be afraid to change it. There is room in the headline for each item for a lot of words, use up the space, this area is just as good as keywords and tags for your items. The more words you use, the better chance of being seen. Use proper keywords on Etsy and tags on each item. If selling a coffee mugs on Etsy with fish images, use all sorts of tags property like “fish” “coffee” “housewarming” “housewarming gifts,” etc. Vary the keywords, don’t just stick to one single theme when many themes fit the item. Don’t be afraid to change the Etsy tags or the headline for the item. If Father’s Day is coming up, add that to the keywords or item title, same with Christmas or Easter or St. Patrick’s Day or any keyword that will fit in with the item you are selling. But only add these words if they are accurate. If selling a t shirt that says, “I love Dad,” that is perfect for Christmas and Father’s Day, but of course would not fit property for St. Patrick’s Day. The more places you sell, the more people will see your items. Many countries as well as U.S. States and sections of the world do not have access to many items. They don’t have a Target or Wal-Mart in their town perhaps, so open up your world to their world. Share your products with the world, you’ll be amazed where people are who are interested in your items. Ship your Etsy items free if possible. If you can add the price into the item and not bring up the price very much, it’s good idea to use free shipping. That is always a draw and it makes people want to purchase. People “favorite” this shower curtain a lot. So we put it on sale. People will “favorite” or “like” items you have on your Etsy page. Make note of it, especially if one or two particular items are getting noticed more than others. It’s a good idea to lower the price or put the items on sale that people are interested in. The best part of this is that the person who liked or favorited an item will be notified that the item was marked down and in many cases, people will purchase in order to get the lower price while the item is on sale. Put Etsy items on sale frequently. It’s easy to have sales on certain items or every item in your Etsy shop. Put items on sale. Experiment. Simply marking down items will attract attention. Experiment with items if possible. Mix things up in your shop. While it’s great to have a theme to your shop, many people will find you and items by doing searches so if someone is looking for a bathrobe and you have that, you may also find someone who is looking for a star-shaped earrings if you have that too. Be eclectic. Give a discount on Etsy for abandoned shopping carts. That is when someone goes to purchase an item but they have second thoughts. There is a feature on Etsy where you can send out a coupon code for a person who is about to leave the shopping cart before finalizing the sale. This is an excellent feature and it works very often. It’s worth the little discount you offer (10 to 15% maybe), in order to get the sale. A discounted sale is better than no sale. And finally, be part of the Etsy community. “Like” or “favorite” other people’s items, like their shops, follow them, read their blogs, comment, be part of the whole experience, the more you give, the more you get. Don’t just be stagnant. Be friendly and engaging. So these are some tips I’ve learned as a newbie on Etsy. It didn’t take long for me to figure these things out. There are obvious things to do like participate in social media, share your items with friends and of course have people review your items after they buy, but these 10 items above seem to be overlooked most of the time. I hope you take them into consideration to help your Etsy shop make more sales. Paper Mouse Pads; all the rage! Paper Mouse Pads are the newest thing in our product line. Surprisingly, it seems as if most people use their cell phones to browse the internet, but desktop computers are still the main instrument for that in offices. Millions of people all over the world use their desktop computers to conduct business and of course, mouse pads are used along with the computers. Our new concept is the best of two worlds – mouse pads and writing pads. They come 50 sheets per mouse pad, are the standard mouse pad size – 8.5″ x 7.25″. The paper is 60# Offset and contains 30% Post-Consumer Recycled Fiber. There is a chipboard backing. The paper mouse pads are great promotional items and are used daily. They’re convenient and fun and you can anything you like printed on them in full color with a full bleed, all included in the cost. There are no set-up fees and like all of our products, shipping is fast and free. Check the paper mouse pads out here: thediscountprinter.com/mousepads1, we think you’ll like them. We’ve added custom printed Solo cups to our line this year, they’are new for 2019. For many years folks have been asking for Solo-brand cups and now we have them. And guess what, they don’t just come in red, we offer them in blue and white, too! 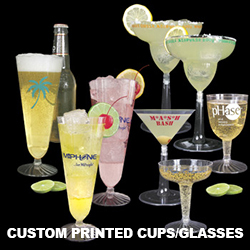 We’ll print whatever you like on the cups – your logo, special imprint message – whatever. Beer pong cups never looked so good! We offer no set-up fees and free shipping! Add a little fun to your next party or event – brand yourself with personalized Solo cups. Never miss a blog post again, SUBSCRIBE HERE. We’ve noticed that people place their printing orders differently online. It changed in the last few years, I’m not sure when or why, but it’s reversed. It used to be that people would order items on our site, TheDiscountPrinter.com, you know, custom printed pens or custom printed post it notes, they would go through the shopping cart process, then send us their art for printing. We would send them a proof, get their approval and we would print the items. Now it’s reversed. Now, people email us, bypassing the ordering and shopping cart process. They send us their art via email and a note that says, “please print 1000 custom printed post it notes” or “Please print 2500 personalized paper cups” and they attach the artwork. We then will take the art or sometimes it’s just text, and we’ll make up a proof, put it together with an online invoice personally made for their order and we’ll send the customer a link. They then complete the order that way. We have been printing custom post its and custom pens and party cups and things for over 35 years and things have changed so much in that time. So as it stand now, anyone can easily send us their promotional items order via email and we’ll take it from there. For more free marketing info, subscribe to our Xpectmore. com blog, sign up here. Custom printed post it notes, custom printed post its, custom sticky notes, whatever you call them, they are more popular these days than they have ever been. With our quick printing, full color post its, we get the pads done fast and shipped fast, many as fast as 24 or 48 hours. Yes! Custom printed post it notes in 24 hours! These are genuine 3M post it notes. We make it fast and easy to order post it notes, too. Most custom notepads are not what you think. While people use them to write on, so many are used as advertisements, business forms and invitations. The whole post it note is printed – the full sheet. We have a gym client who uses the post its each month to promote their specials. Same with many pizza companies; they print coupons on the pads and stick them on their pizza boxes as they go out. We also print for many newspapers, who post ads on their front pages using custom post its. Doctors use the pads as forms, so do lawyers and even supermarkets. And there are the ever-popular custom printed Richard Roop real estate post its. We’ve been the main source of those realty post it notes for 15 years now. Order as little as 8 pads or thousands! We have low minimums on post its. We sell wholesale post it notes. We ship free and there are no set up charges on our post it note pads. Give us a shout out – need a quote or more info? Please email us: info@thediscountprinter.com or text us: 305-567-9850 (we text back fast). What do you need? How many sheets? How many pads? Do you know the size? The most popular sizes are 3″ x 4″, 3″ x 3″ and 4″ x 6″. They also come in shapes and of course, start at low minimums. Order as little as 6 full color pads! TheDiscountPrinter.com is proud to be part of the Buy One. Plant One, tree program. Each time a wood phone case is purchased, a tree is planted by Woodchuck, the creator of the cases. We get our phone cases from Woodchuck. We engrave them here, but Woodchuck creates the beautiful pieces. Almost 1.4 million trees have been planted through the Buy One. Plant One program. Put your logo on a wood phone case and we’ll plant a tree in your honor! We’re proud to present our wooden cell phone cases. They are custom engraved with your logo, message or whatever and for every case that is sold, we will plant a tree! Yup! True that. Elegance never looked so good, neither has your logo engraved in wood! The cases come in Mahogany, Cedar and Walnut. And we’re not knocking down trees to engrave cases and then replant trees! They are made from fallen trees, from the finest wood. Five cases is minimum and they are perfect for your select clients at this time of year. We’ll mix and match the cases in quantity of fives, so for instance if you care for Mahogany and Cedar, you would have to order 10 cases and then have five of each style. These cell phone cases are real wood cases, handcrafted with sustainable sourced veneer. They are compatible with iPhone®s 6 – 6S – 7 – 7Plus – 8. We are working on making other style phone cases so we can accommodate all of you. This fully protective case offers a flexible rubber rim on the face, and again, one tree will be planted for every product purchased. So every time you hand a case to your clients, know that a tree is being planted in your name. Subscribe to Xpectmore.com by Email. We’ll email you every time we publish something new.